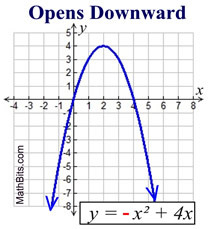 Parabolas have a shape that resembles (but is not the same as) the letter U.
Parabolas may open upward or downward. If the sign of the leading coefficient, a, is positive (a > 0), the parabola opens upward. If the sign of the leading coefficient, a, is negative (a < 0), the parabola opens downward. 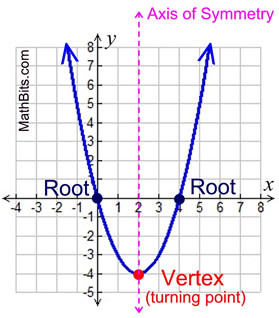 The bottom (or top) of the U is called the vertex, or the turning point. 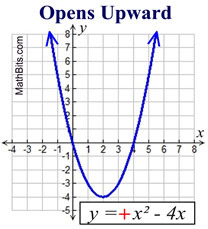 The vertex of a parabola opening upward is also called the minimum point. 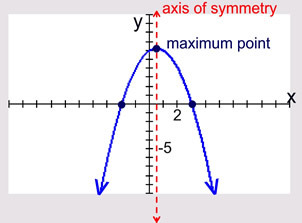 The vertex of a parabola opening downward is also called the maximum point. The x-intercepts are called the roots, or the zeros. To find the x-intercepts, set ax2 + bx + c = 0. The ends of the graph continue to positive infinity (or negative infinity) unless the domain (the x's to be graphed) is otherwise specified. 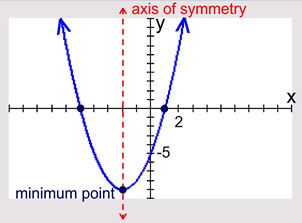 The parabola is symmetric (a mirror image) about a vertical line drawn through its vertex (turning point). This line is called the axis of symmetry. The equation for the axis of symmetry is .